With 4K monitors still weighing in at a hefty price and hardware options limited, PC gamers are moving towards 1440p displays to get the best from their games. BenQ’s latest large screen monitor, the GL2706PQ, might not be designed as a gaming screen but it’s certainly up to the task with a few added side benefits. This 27″ monitor sports a clear TN panel which allows it the advantage of having a 1ms response time. It doesn’t feature any special synching to Nvidia or AMD cards but that can be a good thing if you’re someone who worries about future upgrade paths. The resolution sits at 2560 x 1440, or 1440p in layman’s terms, but don’t be fooled that this is only a ‘half step’ to 4K because the difference between 1080p (full HD) and 1440p is night and day. Even providing the higher resolution for desktop use immediately gives you more real estate for your applications and browser and that’s before you get to check out what a difference the added pixels make to the way games look. Let’s not kid ourselves here, though, this is a work and art monitor first and foremost, with connections for only 1 HDMI 1.4, plus a DVI and DisplayPort. Headphones and line-in are present, as you’d expect from any modern monitor and it does have the benefit of speakers, though they’re only 1w and unlikely to shake your walls even with the loudest bass playing through them. But most gamers will want to use a headset or dedicated sound system, anyway. The speakers are just a nice extra. Physically, the screen takes up a fair bit of room, 533 x 623 x 230mm to be precise, and the stand is fairly large at the base. The black bezel around the edges is thin and finished in a matt paint so doesn’t reflect. It’s a fair weight, but once placed on a desk, BenQ’s knowledge of how people like to adjust their own monitors comes in to play with a very versatile pivot system that can turn the whole screen 90 degrees or move very far up and down (up to 120cm) thanks to the sturdy back of the stand, meaning that it should be a comfortable fit for different height tables. Only the rounded base is in danger of getting in the way due to its size, though it does mean that the whole monitor is kept pretty stable. The 8-bit panel has a contrast of 1000:1‎, pretty standard, and a brightness of 350 nitts which won’t see it winning any prizes for the deepest black or brightest colours but it still seems to beat many standard TVs for clarity and colour depth. The 78 Hz maximum refresh may be too little for pro gamers here, but for those who want to hit the 60Hz mark this BenQ is more than up to the task with fast moving graphics still looking incredible in 2K on this screen. Is it a suitable gaming monitor, though? Well, on a budget, certainly. It’s about £100 cheaper than most of the competition, the screen quality is excellent and the eye care technology should help those playing long into the night. 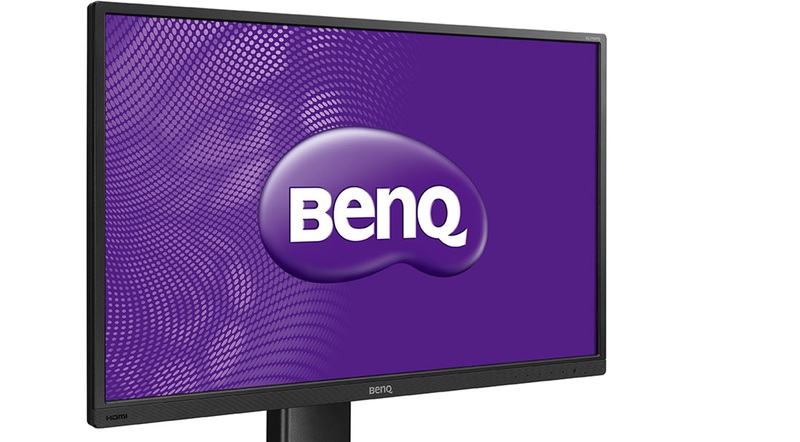 Most of all, BenQ’s expertise in quality shines through in the design of their monitor. It may not feature all the bells and whistles of true gaming monitors, but it’s an ideal option if you’re looking for a good quality budget friendly 27″ display.